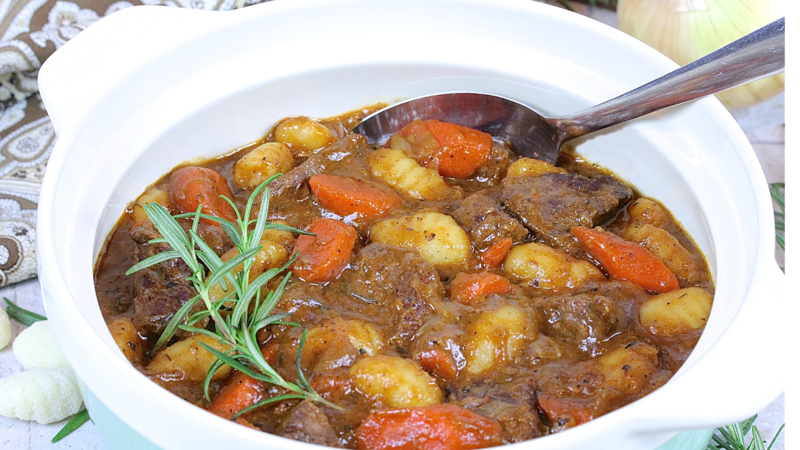 Hearty and comforting beef stew gets a makeover with gnocchi. When you smell this simmering on the stovetop, you know there is good eating to be had! One of the best jobs I have ever had was as an usher at a concert arena after I graduated from high school. I continued to work there every summer while attending college. It was a fun job with lasting memories. Needless to say, I have been to many concerts. There are a few performers I have seen about a dozen times. Tom Petty was one of them. He performed multiple shows when he was in town. From what I remember, all his concerts started with the same song, "Breakdown". It had such a beautiful melodic guitar intro that resonated throughout the arena. When you hear that riff, you knew that a Tom Petty concert has just begun. Sadly, we just lost him this week, but I want to thank him for being part of the fabric of my life that I fondly look back on. RIP. Now, about this stew...it's meaty, hearty, satisfying, and comforting, all of the things I'm looking for in a fall and winter dish. When the weather is cooler and the days are shorter, slow cooked meat, simmering on the stovetop is what I crave. It's early October, but I have made this beef stew twice already. 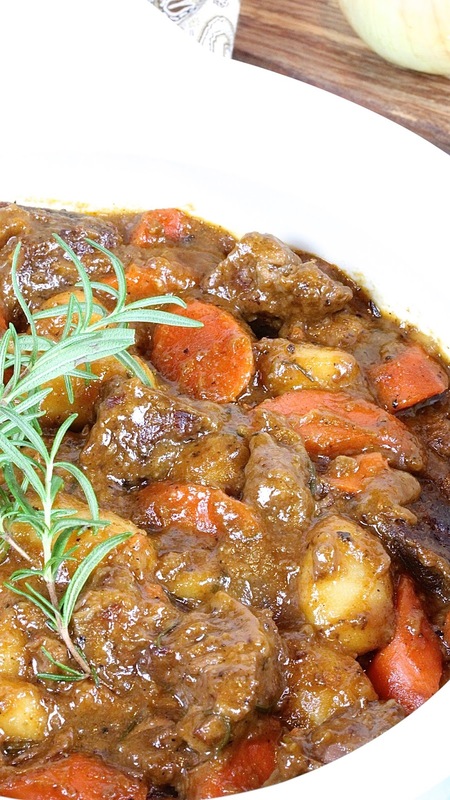 There is a secret ingredient that I like to add to my beef stew—molasses. It adds richness, a depth of flavor, and deepens the color. Molasses is an underused ingredient that I am trying to incorporate more into my cooking. It is a wonderful flavoring agent in meat dishes. I love the convenience of packaged gnocchi. Anything that is fuss-free and cooks up in no time is a keeper in my kitchen! Gnocchi is potato based, and using it in lieu of regular potatoes is an updated and delicious way to switch up beef stew. I add it the last 10 minutes of cooking time. Then it's ready to enjoy! Having mentioned concerts, I would like to close this post with an acknowledgment of this week's national tragedy. I feel remiss by not doing so. My thoughts and prayers go out to all those who were affected. I hope someday we will be able to live in unity, harmony and without fear of senseless acts of violence. Wishing you a safe and enjoyable rest of the week, friends! Preheat a 4-quart dutch oven or saucepan on medium. Place meat to a large bowl. Add flour. Toss to coat. Add enough oil to cover the bottom of the dutch oven. Add half of the meat. Brown on all sides, turning meat over to cook evenly. Transfer meat to a plate. Add oil if necessary to coat the bottom of the pan. Add the remaining meat and brown. Transfer to the plate. Scrape and discard any large black chunks off the bottom of the pan. Add 1/3 cup beef broth. Use a wooden spatula to loosen up the bits. Add onion and garlic, stir and cook for 2 minutes. Pour in beef broth, tomato paste and molasses, stirring to incorporate. Return meat and any juices back into the pan. Add salt, pepper, rosemary, and thyme. Allow to come to a boil. Cover and reduce heat to medium low. Simmer, covered, for 1 hour. Add carrots. Simmer, covered, for 50 minutes or until meat is fork tender. Stir in gnocchi. Simmer for 10 additional minutes or until gnocchi is tender and cooked through. Adjust seasoning to taste. Before serving, remove thyme and rosemary stems. Makes 4 servings. 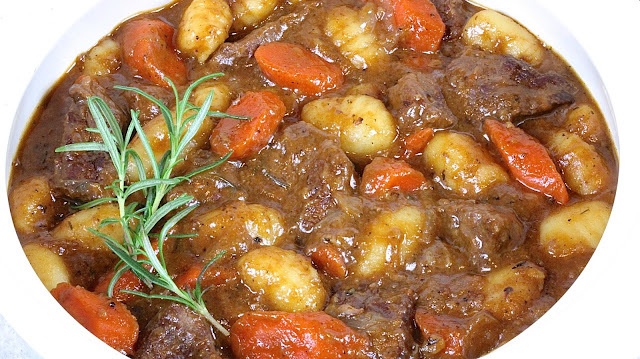 Beef stew is truly a universal dish, isn't it? It's so well loved. Enjoy the rest of the week too, Kelsie! Oh gosh - gnocchi is one of my favorites. And of course beef stew, what a great comfort food. I never thought of combining them - such a great idea. I love this! 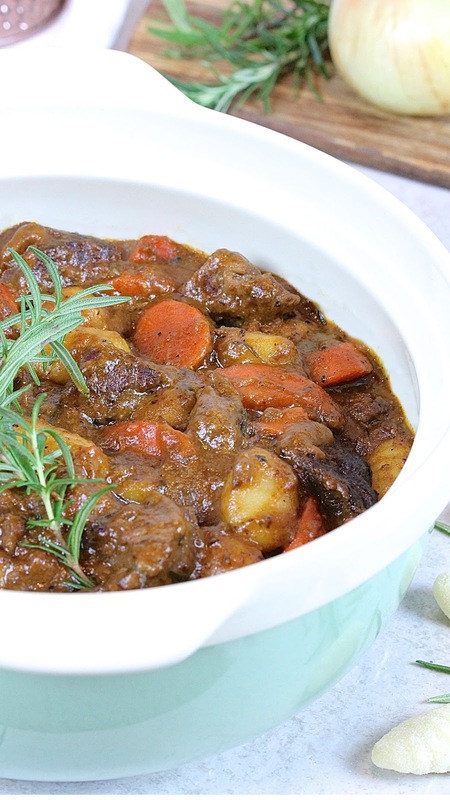 There's nothing better in the fall than a good stew simmering on the stove - I'm not surprised you've made this twice! I'll have to add it to my list! I just love how the smell permeates the house. I'm so glad to hear you are adding this to your list, Liz! Oh my goodness! This looks so yummy and hearty. I've never thought of using gnocchi or molasses in beef stew before, but it sounds so good! Also, I may be blind, but I don't see gnocchi in your Ingredients list. I've never had gnocchi in a stew before and your recipe sounds terrific. Thank you so much, Karen! I hope you give it a try! Aw, rest in peace Tom Petty! It was a sad day losing such a wonderful artist. 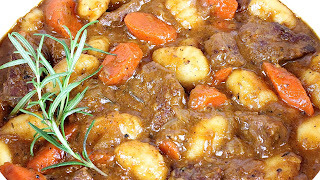 Beef stew was definitely a staple in our house growing up, and I love the addition of gnocchi here. It would have made it 10 times more appealing when I was a kid! I absolutely love gnocchi, but for some reason I've never had it in a stew!! This is genius, girlfriend!! This looks so flavorful and perfectly comforting!! Cheers! I've always wanted to see Tom Petty and never did. You are so lucky to have seen him multiple times! I love beef recipe. This is amazing when you combine beef and gnocchi perfectly. Thank you, Tiana! It is an easy and tasty change from the traditional regular potato.